It all started with an idea: taking a small group of visitors around the historic center of Rome and telling them the little-known stories, mysteries, and legends that would bring the ancient streets to life. It was so much fun that one tour led to another, and another, and another. Eventually, Dark Rome was operating beyond Rome: in the Vatican, Florence, Milan, Venice, and Naples. Our goal was to change the playing field, so we looked at what was already offered – crowded, formulaic tours led by guides with bad English and far too much time spent waiting in line. We set limits on group size, found the best tour guides with the best English (and now French, Spanish, German, Portuguese and Italian, too), sought out the most reliable headphone and bus companies, and brokered agreements to skip the lines at every major museum and monument. We also listened closely to customer feedback and continued constantly adjusting to make sure we offer the highest quality tours. And it worked: in about a decade, we became one of the largest tour operators in Italy. Today, we’re one of the largest tour operators in Europe, serving over 1 million customers per year! Millions of people have chosen us for enlightening travel experiences and have left over 18k 5-star reviews! Our guides are natural story-tellers, experts in their fields, and are always striving to make our tours the highlight of your trip. With more than 150 tours across 9 major European cities, we offer a wide variety of experiences to suit every customer. Customer care is our #1 priority. Our dedicated team are readily available to answer any questions or resolve any issues you may have. All of our tours are the product of meticulous research, detailed planning, and a passion for providing customers with incredible travel experiences. Partnerships and arrangements with top venues, like the Vatican, allow us to provide you with unique access, early admission, and exclusive privileges at Europe’s top tourist sites. Our commitment to offering unparalleled service and unique insight to those who want the most out of travel is summed up by the satisfaction of our customers: to date, we’ve received over 18,000 5-Star reviews from websites like Trip Advisor. At Dark Rome, we always start with the customer in mind and stop at nothing to offer you the best experiences in the destinations you choose. Last year, we gave tours to more than 1 million travelers and to date, we’ve collected over 250,000 reviews from websites like Trip Advisor. We use those reviews, plus other customer feedback, to improve our existing products and create brand new ones. 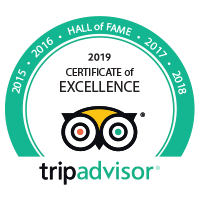 Our dedication to providing the highest-quality tours is the reason we have the Top-Rated tour in the world on Trip Advisor. We pride ourselves on only using the best quality guides for all of our tours. Handpicked for their expertise and passion, each guide is also an incredible storyteller, using anecdotes and insights to bring history to life before your eyes. We believe in the importance of our guides so much, that we have developed a unique in-house training program to help foster their talents further and ensure you really are getting the very best. But don't take our word for it: their names feature prominently in our thousands of 5-star reviews!